Successfully Added 4GB SD Memory Card (Single) to your Shopping Cart. SD card (4 GB) for use with todays portable electronics. 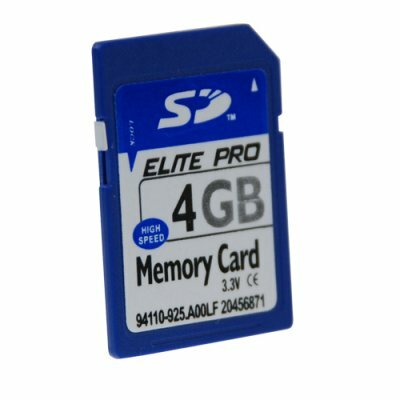 This new wholesale priced SD memory card allows you to expand the memory in your portable electronics so you can have the enjoyment of taking more photos, videos, and music with you without worrying about running out of storage space! We know it can be frustrating to have a great new digital camera but such a pain not have enough space to save all the days action. Well, that problem has now come to an end - a single SD card with a huge 4 GB's of memory! This SD card is high performance, ensuring the longevity of your data. 4GB's is enough memory for storing close to a thousand photos, hours of video, or a thousand MP3's. This card can also be used like a USB flash drive for transferring files from one computer to another or even as a long term data storage device. Don't be fooled by the low price, this is a 100% factory direct brand new SD card. The original holographic seals and individual plastic case help ensure you get the best quality possible, while still being at a low direct to you wholesale price. Brought to you from the leader in wholesale direct from China electronics, Chinavasion. 4GB secure digital (SD) card for use with todays popular portable electronics devices. Instantly move pictures between multiple devices. I will be using this SD card with my digital camera. How can I get the fastest performance from my new SD card? Once you install this in your digital camera or similar device, you will generally want to format the card with your device's interface. That is because the standard format for certain digital camera brands, particularly Canon, can differ from other devices. Formatting for your brand portable digital electronics product ensures memory integrity and maximum speed performance. This is a good price for an SD card, but it does not seem like a wholesale price, whats up with that? These are factory direct and tested brand new SD cards. Other websites in the market these day may try to sell you factory rejects or generic SD cards with fake labels pretending to be Sandisk or other famous brands. We pride ourselves on offering our customers only high quality direct from the factory products at the best price possible. You can be assured these SD cards are new and will perform as stated in the specifications.